Prior to the internal combustion engine, horses were the primary means of moving people and goods in and around urban areas. Cities and towns were covered with them and many horse-drawn vehicles remained in use until the 1930s. This poster begins with the reintroduction of the horse to North America by the Spanish. It then shows a 17th century train of pack horses. 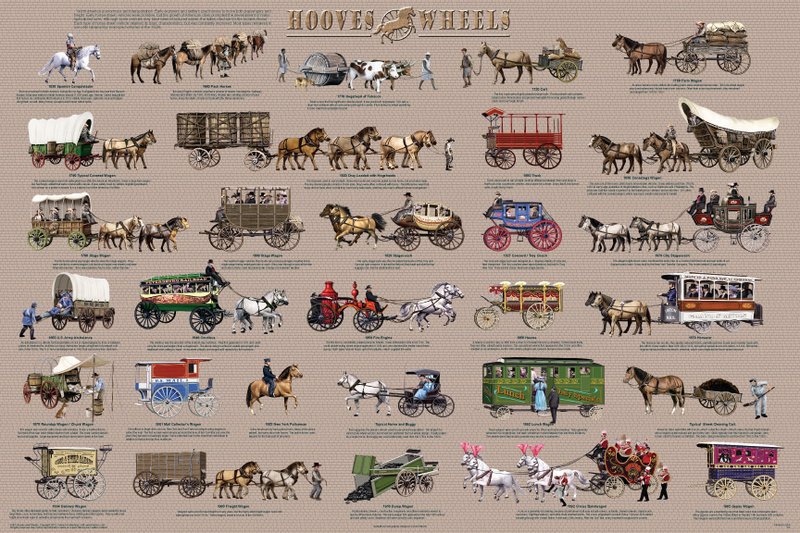 The bulk of the poster is devoted to the most popular and famous horse-drawn vehicles. They include the covered wagon, the Conestoga Wagon, coaches from various periods and many means of moving freight. Includes fascinating specialty vehicles such as fire engines, Civil War ambulance, circus band wagon and even a gypsy wagon. Colorful and informative.